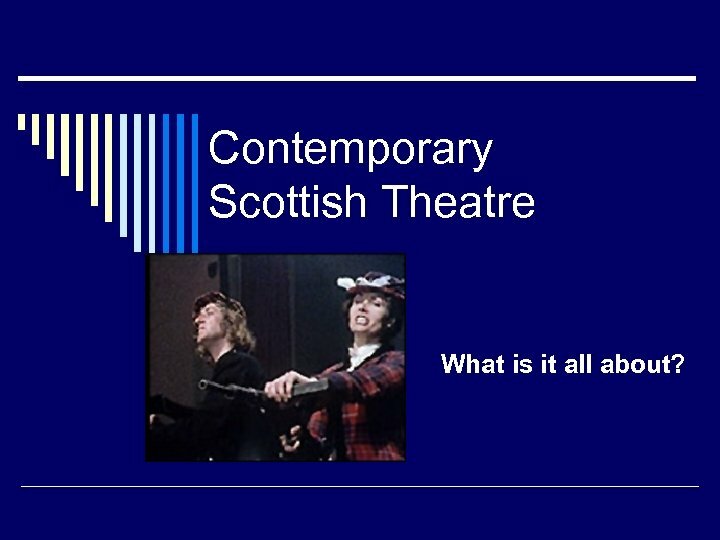 Contemporary Scottish Theatre What is it all about? 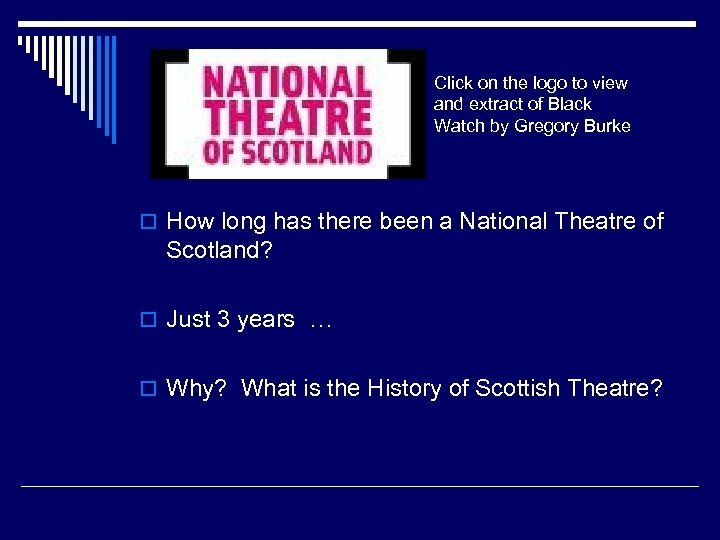 Click on the logo to view and extract of Black Watch by Gregory Burke o How long has there been a National Theatre of Scotland? o Just 3 years … o Why? 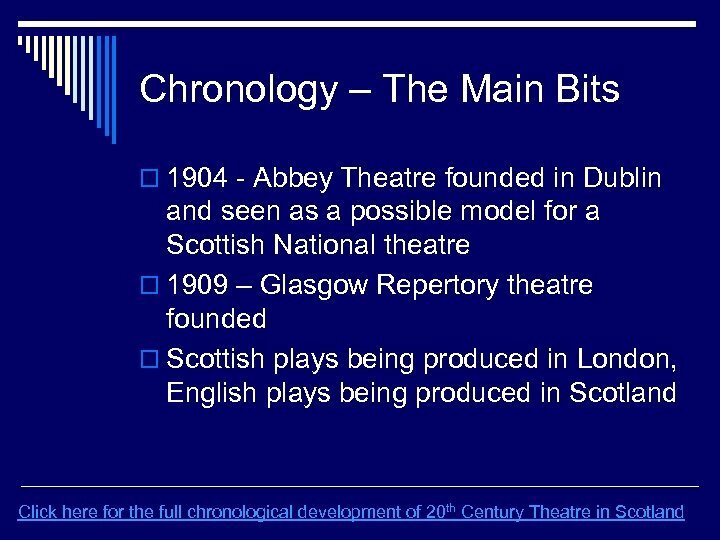 What is the History of Scottish Theatre? 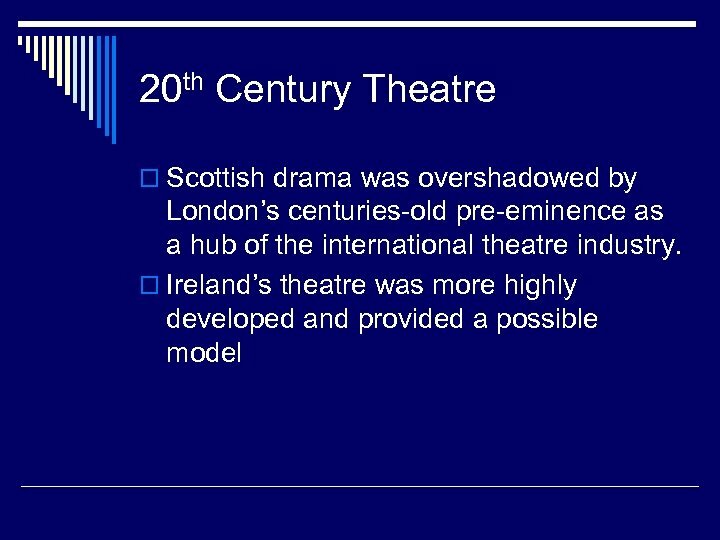 History o Scotland banned theatrical performances in 1214 (medieval period) o The Catholic Church was not a fan of drama – a mix of court performances, pagan-derived folk plays, biblical enactments and festive pageantry. 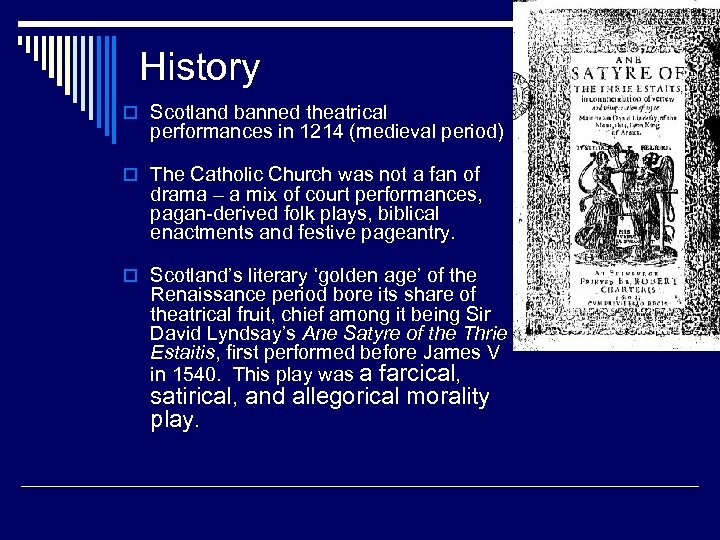 o Scotland’s literary ‘golden age’ of the Renaissance period bore its share of theatrical fruit, chief among it being Sir David Lyndsay’s Ane Satyre of the Thrie Estaitis, first performed before James V in 1540. This play was a farcical, satirical, and allegorical morality play. 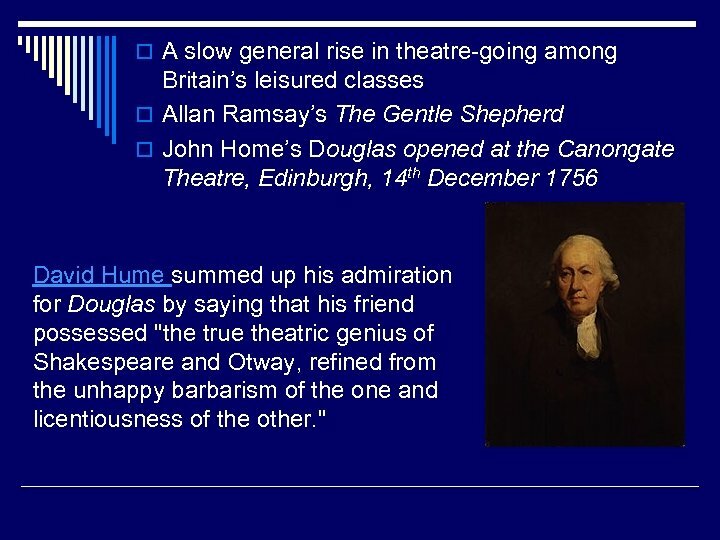 o A slow general rise in theatre-going among Britain’s leisured classes o Allan Ramsay’s The Gentle Shepherd o John Home’s Douglas opened at the Canongate Theatre, Edinburgh, 14 th December 1756 David Hume summed up his admiration for Douglas by saying that his friend possessed "the true theatric genius of Shakespeare and Otway, refined from the unhappy barbarism of the one and licentiousness of the other. " 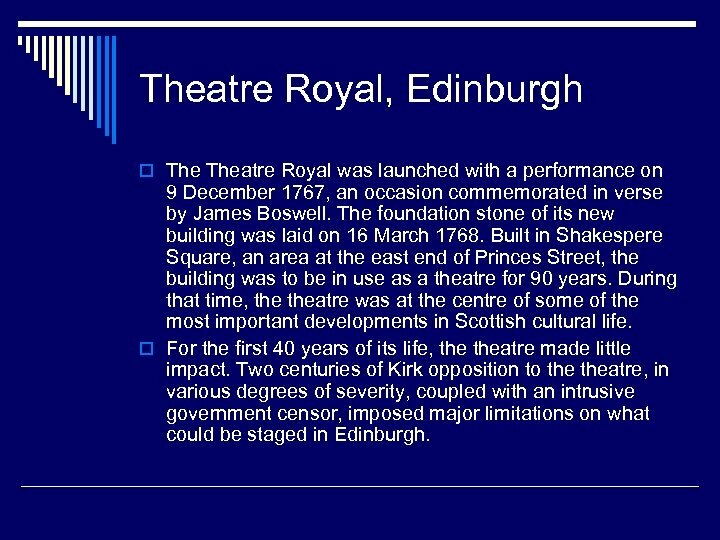 Theatre Royal, Edinburgh o Theatre Royal was launched with a performance on 9 December 1767, an occasion commemorated in verse by James Boswell. The foundation stone of its new building was laid on 16 March 1768. Built in Shakespere Square, an area at the east end of Princes Street, the building was to be in use as a theatre for 90 years. 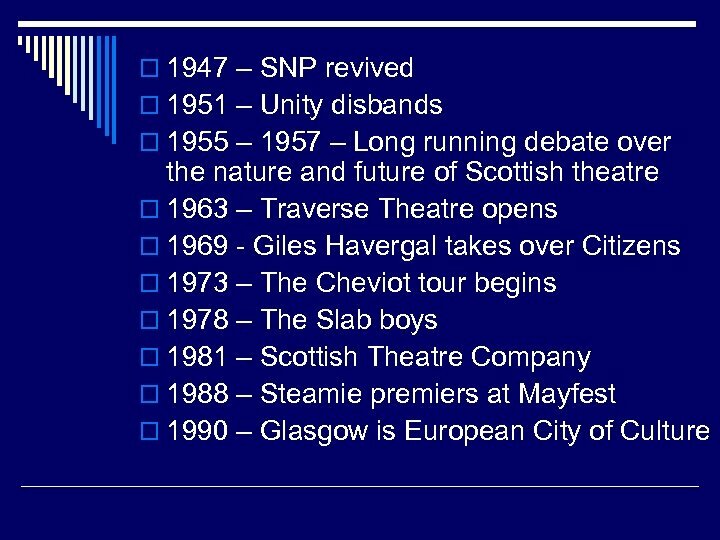 During that time, theatre was at the centre of some of the most important developments in Scottish cultural life. o For the first 40 years of its life, theatre made little impact. 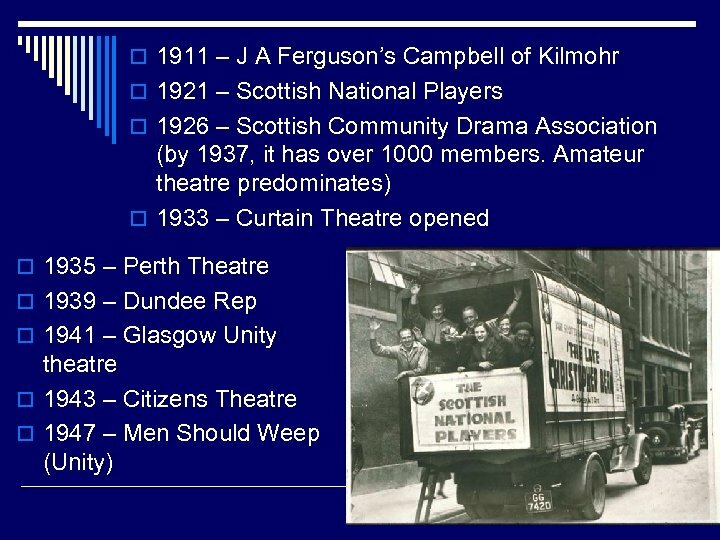 Two centuries of Kirk opposition to theatre, in various degrees of severity, coupled with an intrusive government censor, imposed major limitations on what could be staged in Edinburgh. o The arrival of Sir Walter Scott transformed the situation. 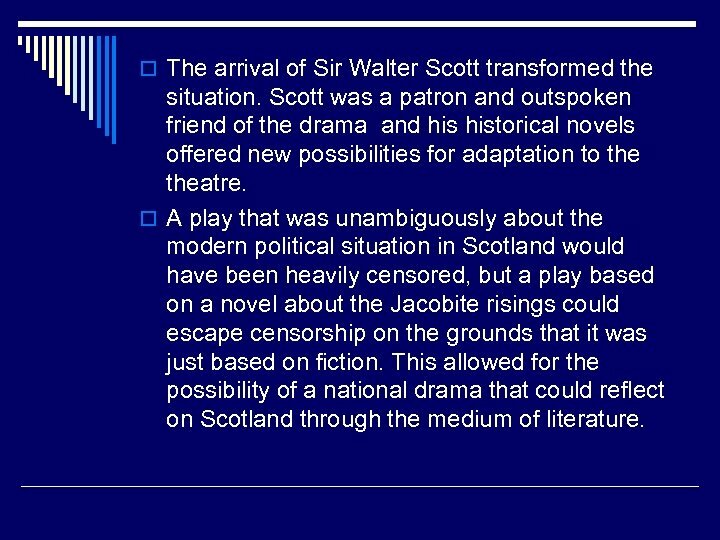 Scott was a patron and outspoken friend of the drama and historical novels offered new possibilities for adaptation to theatre. 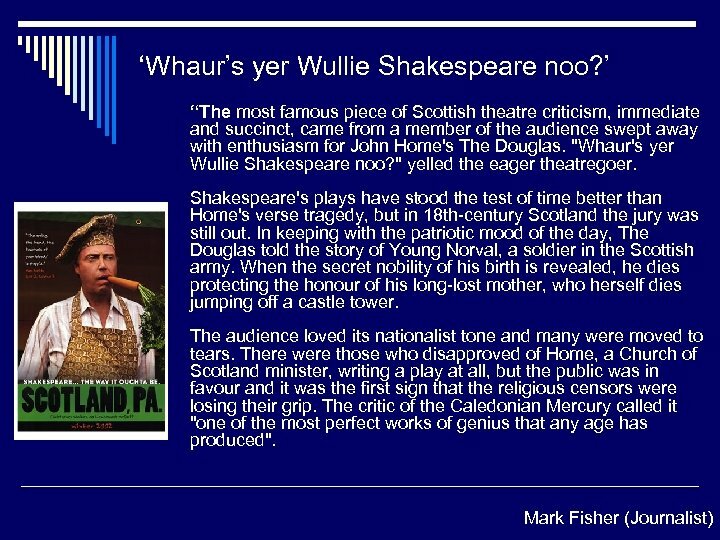 o A play that was unambiguously about the modern political situation in Scotland would have been heavily censored, but a play based on a novel about the Jacobite risings could escape censorship on the grounds that it was just based on fiction. 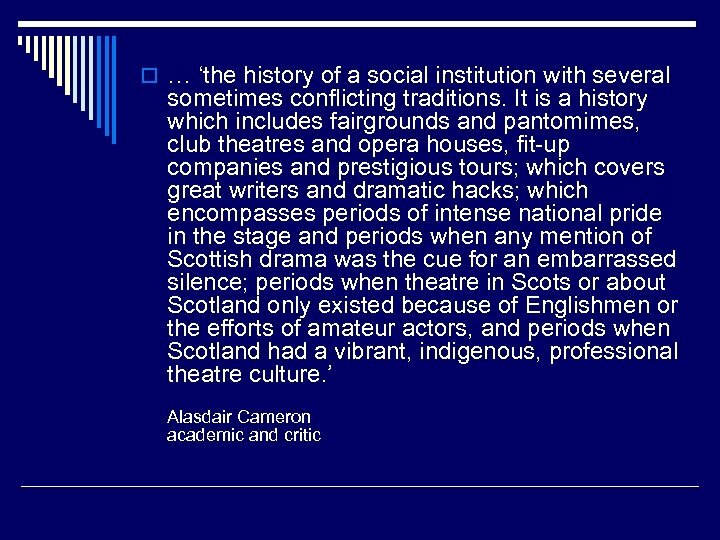 This allowed for the possibility of a national drama that could reflect on Scotland through the medium of literature. 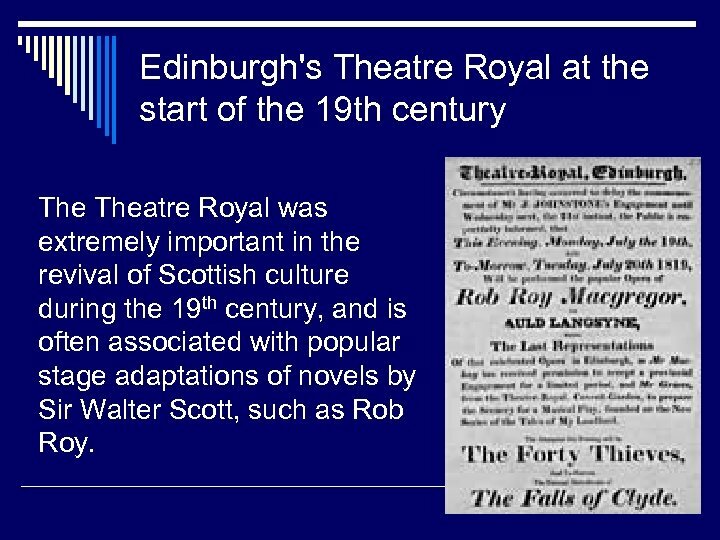 Edinburgh's Theatre Royal at the start of the 19 th century Theatre Royal was extremely important in the revival of Scottish culture during the 19 th century, and is often associated with popular stage adaptations of novels by Sir Walter Scott, such as Rob Roy. 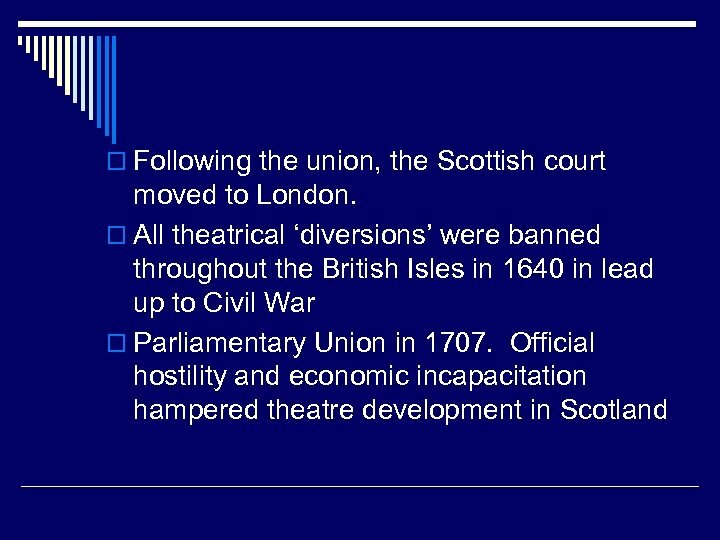 o The first theatre in Glasgow was built in 1764 on the present day site of Central Station. 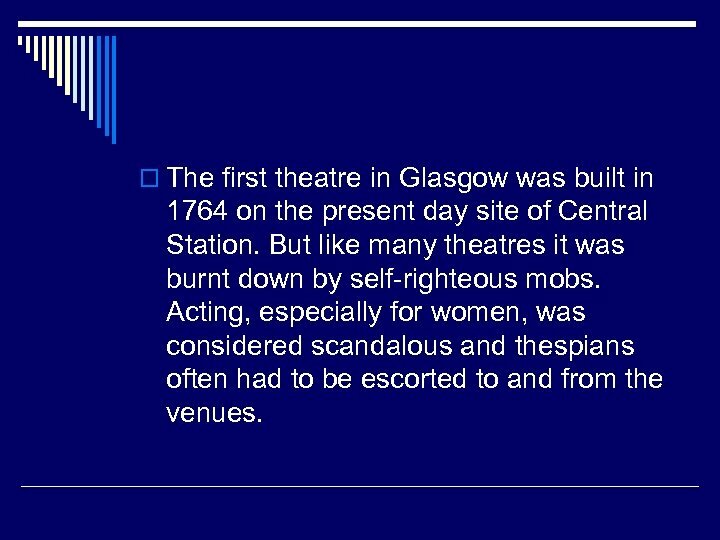 But like many theatres it was burnt down by self-righteous mobs. Acting, especially for women, was considered scandalous and thespians often had to be escorted to and from the venues. 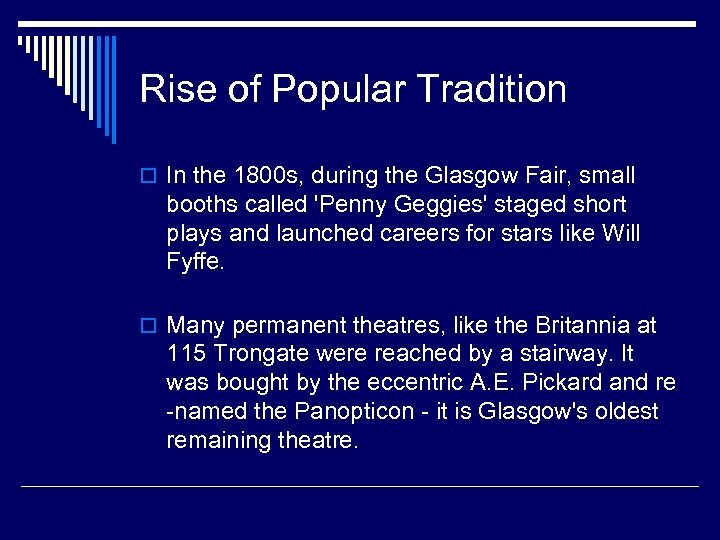 Rise of Popular Tradition o In the 1800 s, during the Glasgow Fair, small booths called 'Penny Geggies' staged short plays and launched careers for stars like Will Fyffe. o Many permanent theatres, like the Britannia at 115 Trongate were reached by a stairway. It was bought by the eccentric A. E. Pickard and re -named the Panopticon - it is Glasgow's oldest remaining theatre. 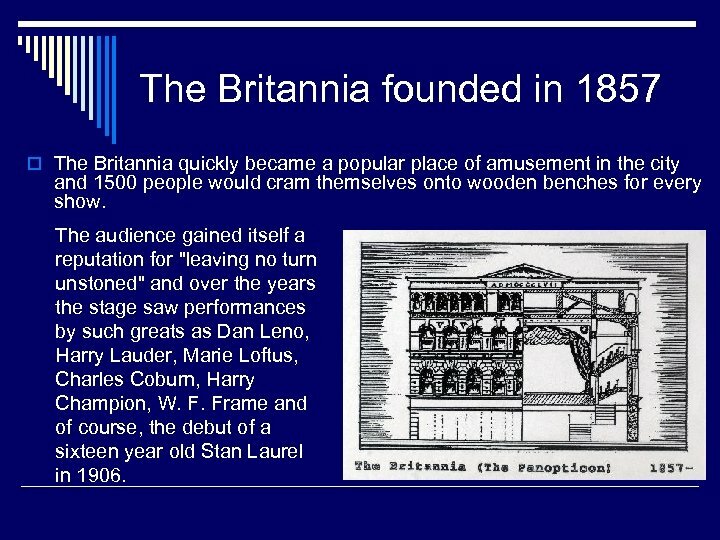 The Britannia founded in 1857 o The Britannia quickly became a popular place of amusement in the city and 1500 people would cram themselves onto wooden benches for every show. The audience gained itself a reputation for "leaving no turn unstoned" and over the years the stage saw performances by such greats as Dan Leno, Harry Lauder, Marie Loftus, Charles Coburn, Harry Champion, W. F. Frame and of course, the debut of a sixteen year old Stan Laurel in 1906. 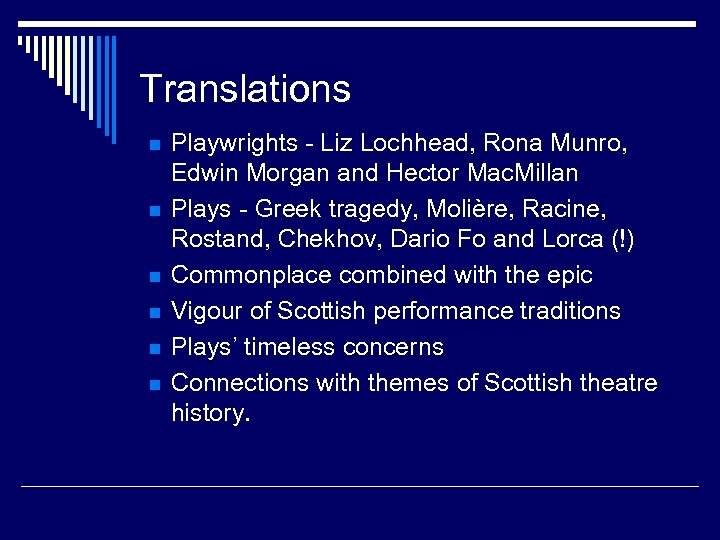 Translations n n n Playwrights - Liz Lochhead, Rona Munro, Edwin Morgan and Hector Mac. Millan Plays - Greek tragedy, Molière, Racine, Rostand, Chekhov, Dario Fo and Lorca (!) 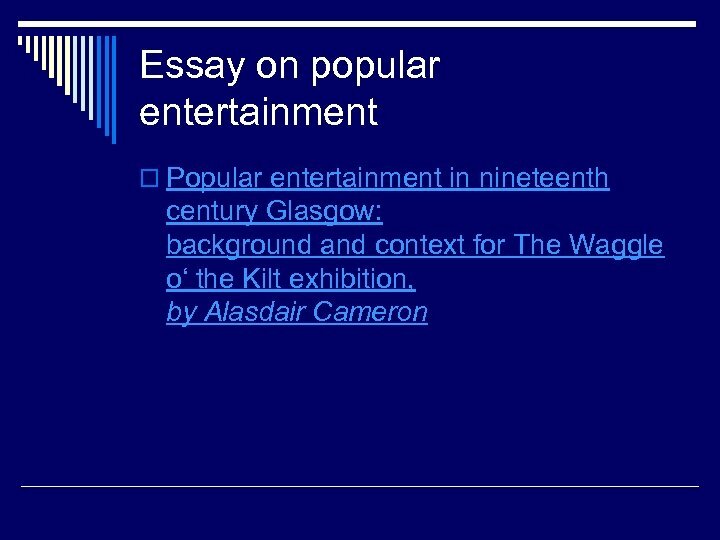 Commonplace combined with the epic Vigour of Scottish performance traditions Plays’ timeless concerns Connections with themes of Scottish theatre history. 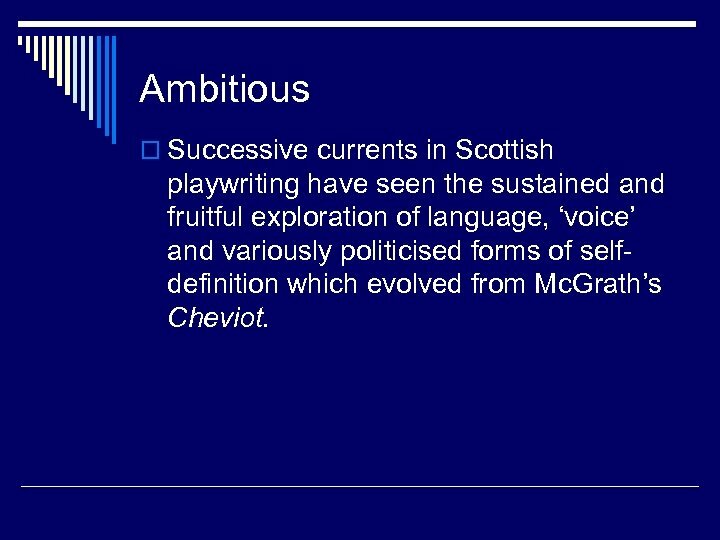 Ambitious o Successive currents in Scottish playwriting have seen the sustained and fruitful exploration of language, ‘voice’ and variously politicised forms of selfdefinition which evolved from Mc. Grath’s Cheviot. 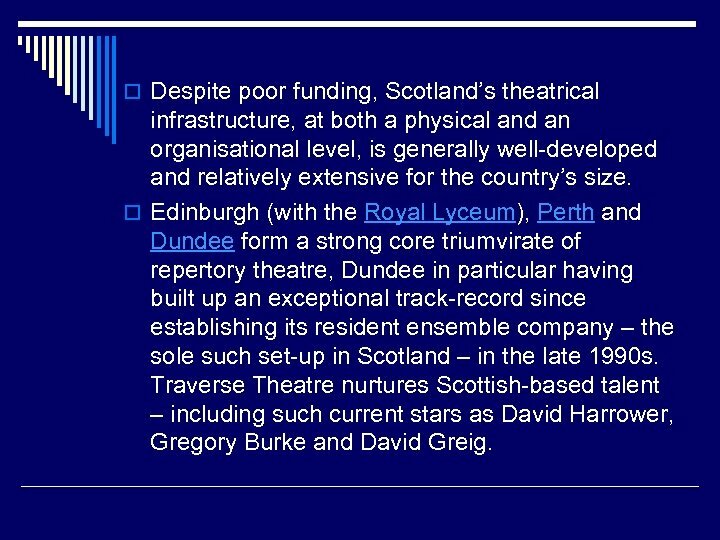 o Despite poor funding, Scotland’s theatrical infrastructure, at both a physical and an organisational level, is generally well-developed and relatively extensive for the country’s size. o Edinburgh (with the Royal Lyceum), Perth and Dundee form a strong core triumvirate of repertory theatre, Dundee in particular having built up an exceptional track-record since establishing its resident ensemble company – the sole such set-up in Scotland – in the late 1990 s. Traverse Theatre nurtures Scottish-based talent – including such current stars as David Harrower, Gregory Burke and David Greig. 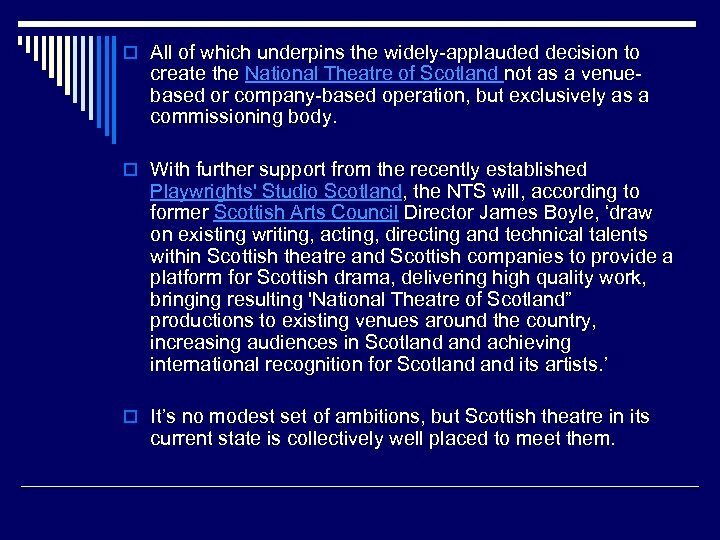 o All of which underpins the widely-applauded decision to create the National Theatre of Scotland not as a venuebased or company-based operation, but exclusively as a commissioning body. o With further support from the recently established Playwrights' Studio Scotland, the NTS will, according to former Scottish Arts Council Director James Boyle, ‘draw on existing writing, acting, directing and technical talents within Scottish theatre and Scottish companies to provide a platform for Scottish drama, delivering high quality work, bringing resulting 'National Theatre of Scotland” productions to existing venues around the country, increasing audiences in Scotland achieving international recognition for Scotland its artists. 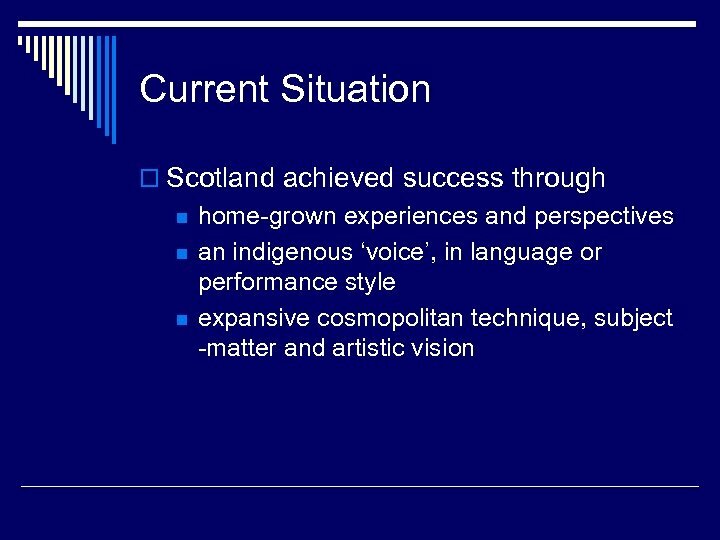 ’ o It’s no modest set of ambitions, but Scottish theatre in its current state is collectively well placed to meet them.